*** Lieutenant did you die in vain? I learnt about your demise from the ticker tape on one of the news channels, last evening. It was a big encounter and a very fierce one at that. A feeling of deep saddness enveloped me as I reflected on your youth which had been sacrificed in Gurez Sector, in the line of duty. What does your death mean? Your name will not be read out in any obituary reference in Parliament, as is done in the UK for all soldiers who fall in combat in the line of duty. 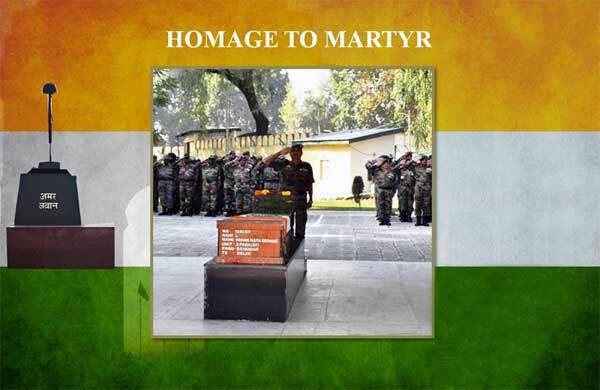 By now your mortal body would be lying embalmed at the Base Hospital and will be flown out of Srinagar later in the day, on its final journey to the cremation ground in your native town or village. You were too young to die, far too young! For whom and for what did you die then? This question haunted me last night and I will attempt to answer you. You were probably from a village or a small town of India. You were perhaps the son of an army officer or JCO, or from an urban or rural civilian background. You could not be from one of the big cities where iron has entered the soul of our youth and where the only driving motivator is quest for money in the surreal environment of the corporate world. Why did you join the army? Ofcourse to get a job. But then that is over simpliying the question. You were possibly motivated by the traditions in your family and clan, you were probably enthused by the sight of your elder brothers, uncles or other men from your community in uniform, you were perhaps enchanted by the cantonment life where you may have spent your growing years. Summary: Far right movements are on the march again. In the US, Europe, and Russia. Here Stratfor looks at the disturbing political developments in the one-time superpower as it copes with rapid social change, their lost status as a superpower, and the economic stress from the collapse in oil prices. The rise of Russia’s far right will undermine the Kremlin’s attempts to overcome the country’s deepening ethnic, class and religious divides. The ultra-conservative movement will continue only to grow, thanks to its media influence and militant youth groups. Moscow will work to curb the forces it has long supported in an effort to ensure that they do not challenge the Kremlin’s writ. Since taking power some 16 years ago, Russian President Vladimir Putin has worked tirelessly to bring about the return of conservative and nationalist values. His government has enthusiastically promoted the Russian Orthodox Church, depicting its patriarchs as the state’s moral compass. After suffering a period of neglect under the Soviet Union, over 25,000 churches and 800 monasteries have been built or refurbished during Putin’s reign. Meanwhile, the Kremlin has also launched a series of youth programs, the largest being Nashi, that teach conservative courses on politics, foreign policy and family values. Finally, after consolidating strategic economic sectors under its control, the government has presented itself as the people’s savior from the liberal, decadent oligarchs who once controlled the country’s resources. The CSIS Commission on Countering Violent Extremism (CVE) was formed to develop a comprehensive and actionable blueprint on how to effectively combat the growing appeal of violent extremism within the United States and abroad. Specifically, the Commission considered what the next U.S. administration must do, in close collaboration with governmental and nongovernmental partners, to diminish the appeal of extremist ideologies and narratives. This bipartisan Commission was composed of 23 public- and private-sector leaders from technology companies, civil society, the faith community, and academia. Since its public launch in February 2016, the Commission met six times and consulted with more than a hundred experts and practitioners throughout the United States, Europe, South Asia, Southeast Asia, Africa, and the Middle East. The Commission’s consultations were augmented by extensive research and a survey conducted in China, Egypt, France, India, Indonesia, Turkey, United Kingdom, and the United States. This report is the culmination of the Commission’s deliberations. It outlines a comprehensive strategy for the incoming U.S. president, combining bolstered investments in soft power alongside sustained military and law enforcement efforts, strong and steady U.S. leadership, and an expansion of public-private partnerships to scale up proven CVE interventions. The CVE Commission and this report were made possible by generous support from founding member Mark Penn, as well as from Fred Khosravi. Greater Balochistan – southwestern Afghanistan, southeastern Iran, and western Pakistan – has recently encountered a windfall of infrastructure development. As China assists their Pakistani counterparts in constructing and operating the deep-water port of Gwadar, less than 200 kilometers away India and Afghanistan have begun constructing their Iranian equivalent at Chabahar. Both of these projects, and the infrastructure networks emanating from them, are laying the groundwork for a movement of peoples yet unseen in the region. Expectedly so, because what stands in between China’s efforts to establish full hegemony over the Asia Pacific are the other two major Asian Powers, namely, Japan and India. Adding salt to the Chinese wounds on this score is the over-riding strategic reality that both Japan and India have sound strategic convergences with the United States on the subject of security and stability of the Asia Pacific and so also the wider Indo Pacific Asia in which India has a predominant role. China would also be painfully aware that should ever the United States ever waver on its resolve to uphold Asia Pacific security against Chinese hegemonistic assaults, there is no reason to doubt that Japan and India put together could rig up an Asian coalition with other Asian nations on China’s periphery to checkmate China. This may not be easily visible presently but when the critical moment come such Asian nations would strategically coalesce around Japan and India. China’s temerity needs to be noted when it warned Japan and India before the Abe-Modi Summit Meet that both Japan and India should keep aloof and not meddle in the South China Sea dispute. It is worth noting that in the Joint Statement there were implicit references to China’s flouting international conventions on this issue. Some may argue that the references should have been more direct but then in international diplomacy some things are best said less directly. That China should have resorted to warning Japan and India in the run-up to the Summit Meet itself indicates that China was well aware that such references would be forthcoming. GDP growth: In the short term, due to the cash crunch and downtrend in everyday transactions, one can expect a quarter or two of slower growth. Let’s also remember, tax-evaded money boosts demand. Now that cash-based black money is in decline, consumption demand will weaken. The October-December quarter growth will certainly be impacted aversely by demonetisation. And maybe even the January-March quarter. The goodwill generated by deciding to go after black money through demonetisation can quickly turn into public disenchantment. Here are 10 ways to push money into the economy without damaging the larger goal of flushing black money out of the system. The winding queues before banks and ATMs should tell the Narendra Modi government one thing: the only way to stem the panic and rising public anger is to push as much cash as possible into people’s hands before things get out of hand. The goodwill generated by deciding to go after black money through demonetisation can quickly turn into public disenchantment. More so when rival political parties are willing to fish in troubled waters. The key takeout for the government is that the cash crisis is self-fulfilling. If cash is short, people will hoard it. Even if the banks and ATMs are spewing more cash, people will draw more of it for a while till they visibly see queues shortening. The only way to defeat this hoarding instinct is to make money available in plenty. #1: Salary date in the organised sector is just a fortnight away. The government can make available, say, Rs 4,000-5,000 in cash to public sector and large private companies for payment to employees, which can then be deducted from their salaries. Sending cash to organised sector employees will reduce queues at ATMs and banks and the money will be distributed in an orderly way at the corporate level. To prevent this facility from being misused, companies can be asked to give the PAN, ID and mobile number details of employees receiving this money. This will prevent employers from distributing their own black money to employees. In the ultimate analysis, whether Tata wins or not, the solutions he needs for his debt-laden group may not be substantially different from what Cyrus Mistry may have had to offer. Old soldiers, they say, are always preparing for the last war. And so would seem to be the case with Ratan Tata’s fight to rescue the Tata Group from the clutches of Cyrus Mistry, recently ousted Chairman of Tata Sons. The battle has now shifted from Tata Sons to the various Tata company boards where Mistry remains chairman. This battle is likely to be substantially different from the one he waged in the early 1990s, when Ratan Tata was chosen to succeed JRD Tata as Tata Sons Chairman. At that time, the people he had to fight to gain control of the group were senior CEOs who had already been well-entrenched in the group – Russi Mody at Tata Steel, Sumant Moolgaokar at Tata Motors, Darbari Seth at Tata Chemicals, Ajit Kerkar at Indian Hotels, and AH Tobaccowala at Voltas. But they were all ageing satraps. Ratan Tata had time on his side. Tata managed to see them off by imposing a new age limit for executive directors in 1992. But even so, it took him five years to oust Ajit Kerkar at Indian Hotels, which happened only in 1997. In 2002, the age group for non-executive directors was lowered from 75 to 70, but was raised again in 2005, possibly to accommodate Rata Tata, who would have had to retire much sooner had it been retained. Tata turned 70 in December 2007, but actually retired as Chairman of Tata Sons only in 2012. But unlike the 1990s, when the financial institutions backed him and independent directors were more old retainers than directors with real independence, today’s scenario is different. And time is not on Tata’s side. He will be 79 next month. Perhaps the only high cards he holds relate to the group’s crossholdings, which are higher now than in the 1990s. If the battle moves to shareholders, Tatas will have the votes to dispel most challenges. Indians spend close to $2.4 million annually to get their scientific research output published in different open access (OA) journals, authors of a new study say, raising concerns that scientists often have to cough up two months’ salary to get their work into those journals. "We estimate that India is potentially spending about $2.4 million annually on Article Processing Charges (APCs) levied by those journals. To publish a paper in OA, some journals levy a charge that is equivalent to two months' salary of an assistant professor in India," Muthu Madhan of DST Centre for Policy Research, Indian Institute of Science, Bengaluru, told IANS. Summary: Technology is evolving at a fast pace today and its promises and concerns keep shifting. There is a need to outline a path to think through technological change and to shed light on the values that technology regulation ought to promote in order to encourage innovation. Innovation and creative re-engineering are pivotal to the well-being of people and advancement of nation states. Developing nations, with fewer legacy systems in place, provide greater avenues for technology enabled change, and India is no exception. However, for innovation to achieve its intended outcome, important background conditions such as training and guidance to think up creative solutions, a wider ecosystem to finance and incentivize innovation, and a state willing to take chances, as well as promote private entrepreneurship, are required. Unfortunately, post-independent India subscribed to an economic philosophy where the state assumed central authority to decide the allocation of resources and the direction and scale of private sector activity. This centralization of decision-making proved harmful to the ushering in of a paradigm shift in the way goods and services were delivered, prompting former Prime Minister Rajiv Gandhi to famously remark that only 17 paise of every rupee earmarked for various welfare packages reached the citizen. Under the guidance of former Prime Minister P.V. Narasimha Rao, slow changes were initiated, resulting in a more vibrant role for the private sector and more avenues to raise capital. Simultaneously, regulatory institutions emerged to replace the license-permit Raj and regulate the interaction between private players, consumers and the state, in vital sectors such as capital markets, electricity, telecommunications, and insurance. These developments coincided with a revolutionary technological shift, as a project incubated in the 1960s in the U.S. Defense Advanced Research Projects Agency (DARPA) came into its own, and the internet era commenced in right earnest. Witnessing exponential growth that put Moore’s Law to shame, the Internet soon became a powerful tool for finding and sharing information, learning new skills, facilitating the delivery of public goods and services, seamless cash transfers, and a host of other applications. More importantly for India, devices capable of Internet access have kept shrinking in size and cost; currently all smartphones and other mobile devices come equipped with capabilities to access the net. The Internet and Mobile Association of India recently estimated 371 million mobile Internet users by June 2016. 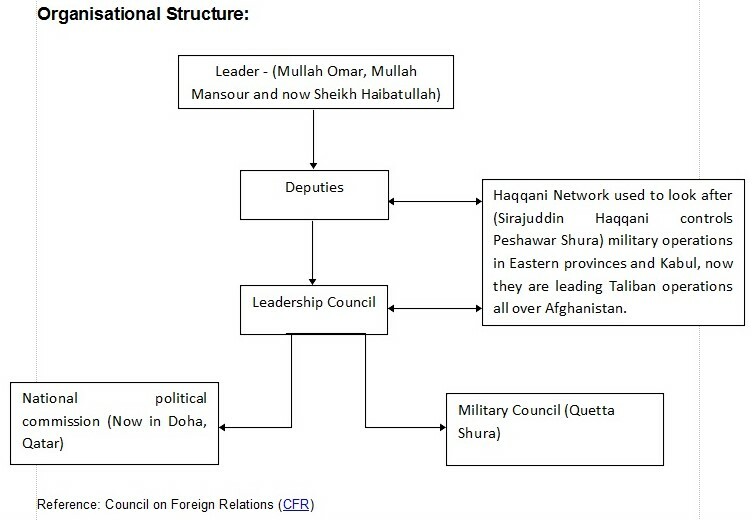 Since American offensive started in Afghanistan against Taliban regime in 2001, the entity remained homogeneous without any serious fractionalisation in exile till June 18, 2013 when Taliban political office in Qatar was inaugurated. According to Mullah Rasoul, leader of one of the breakaway faction of Taliban, Mullah Omar was killed one day before the opening ceremony of Qatar office. 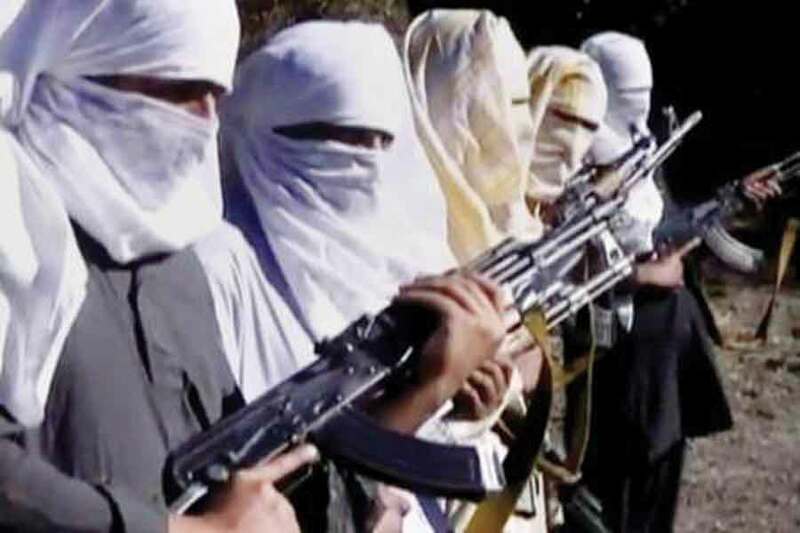 However despite the fact that leadership continues to change after this event, the organisational structure of Taliban remains more or less intact. 2013-14 was an important year for insurgency in Afghanistan, because of a host of reasons, most notable being; withdrawal of majority of the Coalition Forces, Mullah Mansour’s unofficially takingover of Taliban operations, Dr Ghani’s selection as Afghan President and new military and political leadership take over in Pakistan. These changes were followed by the resurgence of Tehrik-e-Taliban Pakistan (TTP) and Pakistan’s military operations in North Waziristan area which forced many disgruntled groups to move from Miramshah, Bannu, DattaKhel and Orkazai region to border provinces of Afghanistan, including Kunar, Nagrahar and Pakhtia etc. Further this migration of militants gave birth to so called Islamic State (IS) in those provinces. Amidst all this, Taliban continues to redefine its approach towards changing scenario in Afghanistan and according to that it has reorganised its leadership and continued to mount heavy casualties on Afghan forces by adopting new tactics. When Congress voted overwhelmingly last month to override a veto by President Obama and pass a law allowing victims and survivors’ families of the September 11, 2001, terror attacks to sue Saudi Arabia, foreign policy experts in both countries predicted a new crisis in Saudi-U.S. relations. In addition to violating the long-standing principle of international law that insulates governments from suits by individuals, critics said, the bill was insulting in its suggestion that the Saudi government was somehow responsible for the attacks. While official statements in Washington and Riyadh were restrained, independent analysts said the measure would exacerbate existing tensions in the bilateral relationship and might lead the Saudis to reduce their cooperation on antiterrorism activities. Saudi citizens lit up social media with outrage, calling for drastic retaliatory action. Some rallied around a call to boycott American products and services. PARIS — In a series of attacks on “precisely chosen targets,” nine Islamic State militants wrought devastation in Paris on Nov. 13, 2015, killing at least 130 people. A year later, the world is still grappling with violence exported from Iraq and Syria and carried out by those influenced by the missive to build an Islamic caliphate, even as the group’s footprint shrinks. How did Europe get to this point? And why is it so hard for authorities to stop it? This is a look back at The Post’s reporting on a year of attacks, and an attempt to explain how we got there. The attacks in Paris began at just after 9 p.m. Nov. 13, a Friday night that began like any other. More than 80,000 packed the Stade de France to watch the French national soccer team take on Germany. The City of Love, home to 2.2 million, was bustling. It would not be unrealistic to see the removal of some US sanctions on Russia (and Russian counter-sanctions) as one of the early acts of President Trump. Has the “Cold War II” crowd been silence by this surprise move toward a thaw in US/Russian relations? We can only hope that this surprise move has put a monkey wrench in their plans. For the neocons, who have few actual salable skills, survival and prosperity depends on them finding and promoting the next “Hitler” of the day. They had their Saddam, Gaddafi, Assad, etc. But turning the US against Russia and Putin should have kept them on easy street for many years to come. Army officials have seen the growth in cyber defense coming down the pike. This is in part to its Defensive Cyberspace Operation infrastructure program. For its part, the Program Executive Office for Enterprise Information Systems is tasked with providing DCO the non-tactical, enterprise network. PEO EIS is executing a four pronged approach based upon an operational needs statement for DCO, which includes DCO infrastructure, cyber protection team tools, web vulnerability, and the big data platform – developed by DISA and Army Cyber Command. Ocasio also reportedly said that rather than having teams procure cyber tools from industry under previous models, which he termed “a hodgepodge from an acquisition perspective,” a new process would be more formalized and break some of the impediments related to purchasing cyber capabilities in a quick manner. According to talking points on the program obtained by C4ISRNET, this DCO tool suite, as it’s called, will be a critical element of the DCO and facilitate a CPT maneuver baseline, the ability to run software packages that defend the network. The tool suite will provide CPTs sensors, active detection network analysis, threat emulation, forensic analysis, web scanning, planning and visualization tools for conducting defensive cyberspace operations, according to talking points. ARLINGTON: The US Army isn’t counting on airpower in the next war. Without that cover, there won’t be supply drops, recon drones or medevac helicopters picking up your casualties — and you will have casualties. At a two-day exercise in April, U.S. troops practiced waging warfare on an invisible yet vital battlefield. There are two battles occurring in Mosul today. One is in the streets, where coalition forces are exchanging fire with ISISremnants entrenched around Iraq’s second-largest city. The second is taking place on screens, on Twitter, and in the minds of residents and of fighters on both sides. Mosul is an information battlespace as much as it is physical location, and you can’t achieve victory on one battlefield without achieving it on the other. So in the months leading up to the Mosul offensive, the Joint Staff hosted a highly unusual war game. The goal: train Special Forces operators to disrupt ISIS’s ability to command and control forces and “neutralize its ability to increase morale,” according to a Defense Department official. Defense One obtained a writeup of the exercise, which provides a rare glimpse into psychological operations, or PSYOPS. “Focusing on PSYOP as the main activity of a wargame, rather than as part of a full spectrum of Diplomatic Information Military and Economic, DIME, activities, is quite rare within the professional defense community,” the writeup notes.